M0PLA/P SOTA Activations: 25th February 2017. GW/NW-042 SOTA Activation visit. 25th February 2017. GW/NW-042 SOTA Activation visit. GW/NW-042 Moel y Gamelin. 25th February 2017. Grid SJ 176465 Altitude 578m. We arrived back at the car park after completing GW/NW-043 at 11:40 a.m. had a little drink and sorted out our packs ready for the next ascent, I had read that this was 20 minutes to the summit? we made the first summit in 18 minutes (Moel y Faen) and carried on until we arrived at Moel y Gamelin, total ascent time was more like 50 minutes after a few rest breaks. As seen from the photo's above the route that we took (in green), first photo viewed from near the first summit and then a view from the 2nd summit around 200 meters from the trig point. We arrived at around 12:50 p.m. had a quick coffee and decided it was to windy for Jamie to do any cooking and the HF mast was not going to be a good idea. As seen from photo 3 under neath the wind was extremely strong, we even had to put the SOTA flag near the base. If you look carefully at photo 1 you can just see the mast of the summit near Carn y Brian, in total we had walked 7.5 miles from our arrival time of 09:50 a.m. 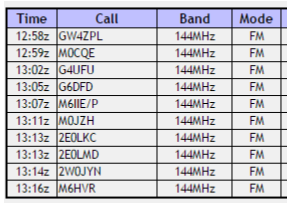 In total we had 10 QSO's on 2M FM. We started our descent at around 13:23 p.m. and made it back to the car by 14:00 p.m. and after dropping all of our gear in the car we headed straight into the Ponderosa Cafe for a well deserved stake pie chips and gravy for me and sausage chips and gravy for Jamie.